A delicious brunch and a fantastic alternative to the “classic” Eggs Benedict! 1. In a pan of lightly salted water boil the potatoes for 15 minutes, drain well and mash in the pan. In another pan of boiling water blanch the cabbage for 2 minutes, drain and rinse under cold water and pat dry with kitchen paper. 2. Heat the oil in a frying pan, add the bacon and fry until crisp, remove from the pan and set aside. Now add the shallot and garlic and fry gently until softened. 3. Mix through the shallot and garlic to the potato, cabbage, bacon, chopped parsley and season to taste. Set aside to cool. 4. Divide the mixture into four and shape into cakes then toss in seasoned flour. In a large frying pan heat 1cm of oil and fry the cakes for 3 minutes on each side. Remove and drain on kitchen paper and set aside in a warm oven. 5. To make the hollandaise, place the egg yolks, lemon juice and one tablespoon of water in the bowl of a food processor. Turn on and mix for one minute. With the motor still running very slowly, trickle the warm melted butter through the funnel on the lid of the processor. The sauce will slowly start to thicken. When all the butter has been incorporated, scrape the side of the bowl and give one final pulse. Season with salt and a little white pepper. You should have a rich buttery sauce. 6. To poach the eggs bring two litres of water to the boil with the vinegar. Lower the heat so the water is not bubbling. Break the eggs into separate ramekins or cups. Slide the eggs into the water and leave to poach 2-3 minutes. 7. 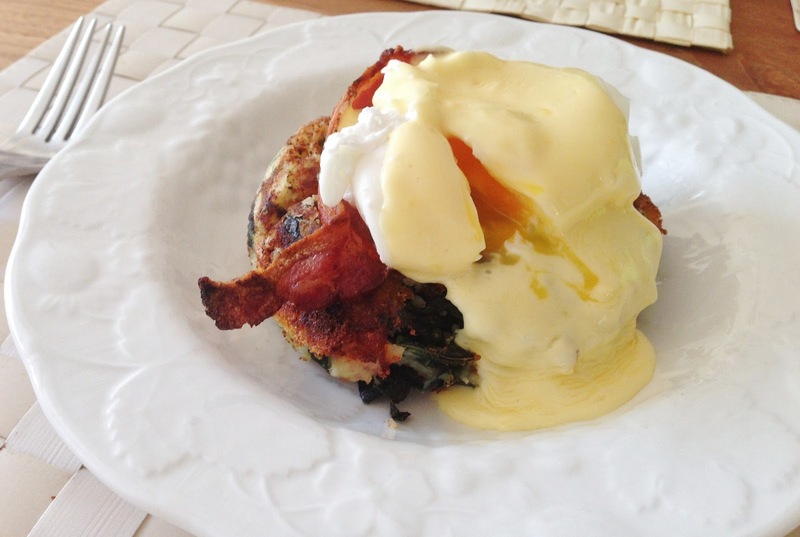 To serve, place a bubble & squeak cake on a plate and top with bacon and a poached egg, spoon over some sauce. Enjoy!